I endorsed Francois Hollande, the Socialist, in his race to become President of France. I wasn’t under any illusion that he would do the right thing, but I figured anything was better than another term for Sarkozy, who was a de facto rather than de jure socialist. Hollande largely has pursued a statist agenda of higher taxes and more wasteful spending since taking office, which is par for the course, but I will give him credit for cutting back on some of the personal excesses of France’s ruling class. Here are excerpts from a CNBC report. Mr. Hollande, a Socialist, and his prime minister, Jean-Marc Ayrault, have ordered downgrades in official luxury… Mr. Hollande has actually taken the train to Brussels, without a state jet following him, and his ministers have been ordered to hit the rails when possible (with a free pass on the national railway system). When they fly, they are encouraged to travel in coach class on commercial airlines. …Official cars have been diminished in size and in luxury. Mr. Hollande has given up the presidential Citroën C6 for a smaller but hardly shabby Citroën DS5 diesel hybrid. He has reduced the ranks of his official drivers to two from three, and they are now supposed to stop at red lights. I’m not naive. It’s quite likely that Hollande is taking these steps solely to score political points. But that’s still more than can be said of Obama and the rest of the political elite in America. 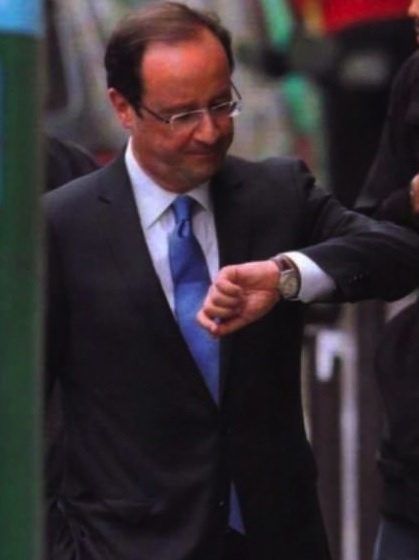 I’m particularly impressed that Hollande is going to obey traffic laws and not inconvenience other people. It is nauseating how Obama’s security people will block traffic for 20-30 minutes ahead of of time because of a jaunt around town. And the same happened during the Bush years, so my grousing has nothing to do with party labels. Other French politicians also are downgrading their means of transportation. Mr. Ayrault gave up his C6 for a cheaper Peugeot 508. Cabinet ministers have also traded down, and the housing minister, Cécile Duflot, an ecologist who was criticized for wearing jeans to an Élysée Palace meeting, has ordered four official bicycles. Yes, the bicycles are another empty bit of political posturing, but wouldn’t it be a splendid idea to see some department heads in the United States wobbling along on busy streets, particularly in the heat of summer or cold of winter? Though maybe we’ll give Treasury Secretary Geithner a riding lawnmower since he’s the Forrest Gump of this Administration. Even security has been put to the knife, at least a little. Junior ministers no longer get bodyguards, and the number of security workers attached to the presidency has been reduced by a third. …Mr. Ayrault has ordered his ministers to reduce their official budgets sharply, by 7 percent in 2013 and by an additional 4 percent in each of the next two years. Bravo, as the French might say (or is that Spanish?). I understand that the President of the United States is an attractive target for dirtbags, so I don’t object to a strong security presence for Obama, but do we really need a Praetorian Guard for a bevy of other government officials? At best, it’s a bit unseemly, sort of reminiscent of some third-world military junta. I’m also impressed that French ministers will be cutting their budgets, though I recognize that they may be using the same kind of dishonest budgeting we use in America (“Sacre bleu, we raised spending by 5 percent instead of 12 percent, so that’s a 7 percent cut!”). The only American official (that I know of) who has done something similar to Hollande is Speaker John Boehner, who chose to do without the taxpayer-funded personal jet that Queen Pelosi used for trips back to California. That being said, I wouldn’t mind giving politicians all sorts of expensive perks if they did things that advanced freedom. So Hollande could upgrade his car if he gave the French people a flat tax. And Boehner could take the private jet out of mothballs if he allowed Americans to shift their payroll taxes to personal retirement accounts. But so long as they keep screwing us with bad policy, then politicians don’t deserve anything. Other than perhaps rusty old bicycles. P.S. Cutting back on personal luxuries for the political elite is not the only area where the French are ahead of the United States. They also have a more dignified way of treating folks who choose to expatriate. And a lower corporate income tax rate. But I’m not quite ready to trade places, no matter how hard Obama tries to make us more statist, I suspect the French will always be worse. 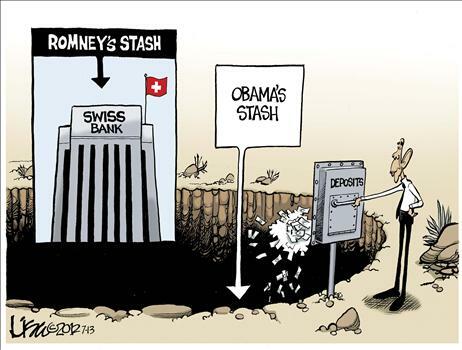 Obama, needless to say, is an expert at squandering other people’s money, as illustrated by money pits such as the faux stimulus and the green energy scam. P.S. Lest anyone think I’m being partisan, the headline of this would be just as accurate if I added “How Bush Spent My Money” or “How Romney Would Spend My Money.” Bush, after all, followed the same fiscal agenda as Obama, and Romney’s track record suggests he will be similarly profligate. P.P.S. Which makes me miss Bill Clinton, who was frugal by comparison. Or Ronald Reagan, who actually did the right things for the right reason. P.P.P.S. You can find more Lisa Benson cartoons here, here, here, here, here, here, and here.